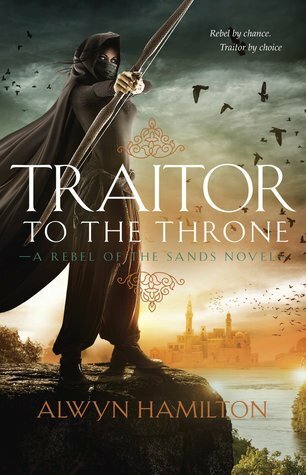 Rebel of the Sands was a New York Times bestseller, published in fifteen countries and the recipient of four starred reviews and multiple accolades. But its sequel is even better. I have been seriously slacking on my reading for the past couple of weeks/months, but I was so excited to get my hands on this one. I loved Amani's story in Rebel and couldn't wait to get back to them. When we first get back with Amani she is, of course, being a badass. She has become all about the mission and the resistance. Amani is still the brave and kind of cocky girl we know and love but now she's got plenty of experience under her belt. Missing from the first part of this book (much to my dismay) is Jin. While I love that there is a mission and that they are both independent characters, I also really love them together. As things progress and Amani gets herself into a rather tricky situation you definitely start to feel the tension. Amani being stuck in the harem brings to light so many emotions for her and also gives us, as readers, a little more insight into Ahmed and Jin's lives. I loved the history we got from her time there and also all of the characters we got to meet and love (or hate). I loved this book for so many reasons, including the interpretation of how war and fighting can take a toll on friends and family. Not only that, but you absolutely get the feeling of how they are all being brought together too. The twist at the end just about killed me, so good luck with that.